There’s a high chance moving into your new dorm room the first weekend in college will be your first experience living “on your own” away from home. For some, it’s very exciting but for others, it can be a little overwhelming. However you feel about it, you’re bound to have some questions about what it’s like to live at PUC. Here are five of the most commonly asked questions about life in one of our six residence halls. How are rooms in the residence halls assigned? Once you’re accepted, you will need to pay a $200 deposit and fill out a housing reservation form, letting us know of your plans. Rooms are assigned in the order they’re received, so it’s a good idea to do this as soon a possible! Paying your deposit also makes you eligible to register for classes (starting in April). Room assignments are sent out during the summer. Learn more about what to do after you’re accepted at puc.edu/alreadyaccepted. Whether you’re rooming with a friend you’ve known for years or someone you don’t know, you’re guaranteed to have a difference of opinion every once in a while. Try talking the issue through with them, and if needed, you can also talk with your RA or your dean. If you truly feel you can’t work it out, you always have the option to switch to another room, so don’t feel stuck. Read our “Three Ways to Solve Issues with Your Roommate” post for ideas on how to navigate possible issues that might arise while having a roommate. Speaking of RA’s and deans, what’s an RA and who is my dean? Each residence hall has a dean who lives in the building. They have a team of RAs or residence assistants, who work with them to ensure each student within their dorm is having the best experience possible. Their goal is for each student to feel like they’re part of the special Pioneer family. Check out the dean profiles on our blog to get to know each of the seven awesome people who work as deans in PUC’s residence halls! One of them may end up being yours! When you get your room assignment in the summer, you’ll also learn who your dean is, and can reach out to them with any questions you might have about your room. What will I need in my dorm room? Each residence halls room contains two beds, dresser drawers, closets, desks and chairs, and one sink with a mirror. However, figuring out what else you’ll need to pack and bring to college can be difficult so to make it easier we came up with a packing list to help. Read our “Your College Packing List” post for ideas about what you probably should bring with you for your move up to PUC! What dorm activities I can be involved in? There’s always a lot going on in the residence halls, and you can be as involved as you want! There are weekly worship events your RA will hold for your hall, and usually an all-dorm worship too. The same goes for socials, like movie nights or spa nights. In the men’s residence halls, there’s almost always a group surrounding the lobby TV watching a sports game. Many dorms also do pancake breakfasts or brunch on the weekends. You can also grab a friend and hit the sauna in Newton (for men) or blow off some steam in Andre’s workout room (for women). PUC has a team of amazing residence hall deans, RAs, and desk workers who can’t wait to get to know you. We’re excited to have you on campus soon! 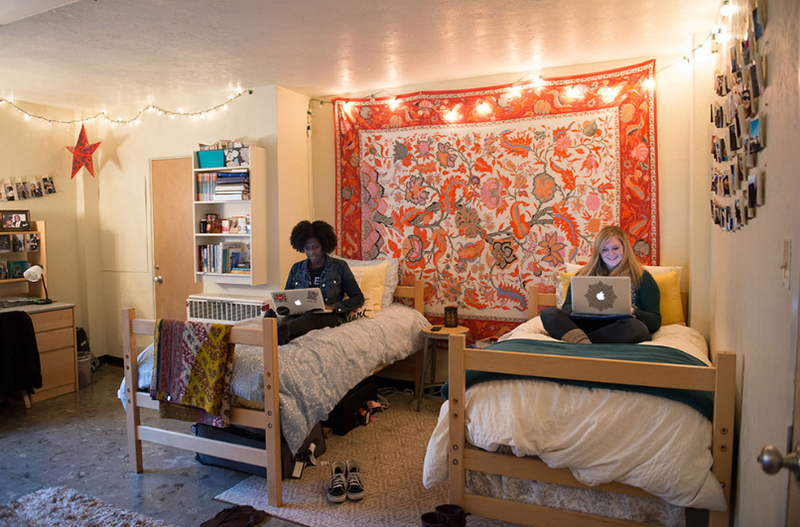 If you have questions about the dorms or your housing before you get here, call (800) 862-7080, option 2 or email admissions@puc.edu to get connected with one of our admissions counselors for help! Three years ago, I graduated from PUC. It was one of the greatest days of my life, the culmination of four years spent studying, growing, and oversleeping. I was thrilled to have reached the end, but sad to no longer be on the journey. One of the best parts about that journey was the residence life. I know when most people think of cool college living, they don’t think of dormitories. It’s about getting an apartment, joining a fraternity or sorority, and not worrying about curfew. But at PUC, dorm life is a huge part of college. It’s as essential to the experience as buying books and writing papers. You can get off-campus housing (maybe), but for my lender’s money, I wouldn’t consider it. My home from 2007-2011 was Grainger Hall, one of three male dorms on campus. Grainger is like a fraternity in that it emphasizes close community among its 160 tenants. The residents call themselves MOG, Men of Grainger, and are active in dorm events, such as Olympic games and Thursday night worships, and campus life, including vespers programs and athletics. They also hold fast to many long-standing traditions. But what exactly makes a Man of Grainger? I was fortunate enough to serve as the head residential assistant of the dorm my final year (look out), so I figured I should research it and find out. 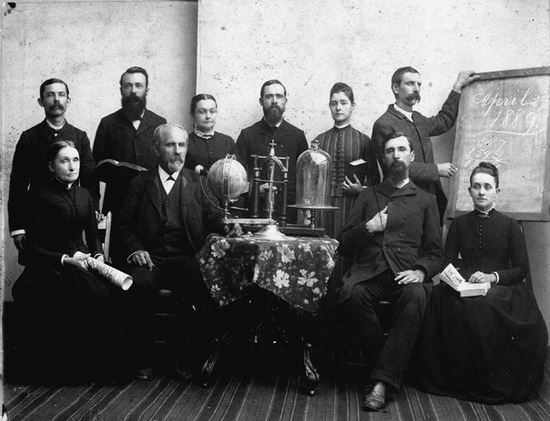 William C. Grainger, seated, second from left, looking like a boss. Grainger Hall’s namesake is William C. Grainger, a teacher at the original Healdsburg campus who became the college’s second president in 1886. Under his leadership, the college flourished. A tall, thin, dark-haired man (think the Adventist Abe Lincoln), Grainger came west after a grasshopper plague forced him out of Missouri. Tell me that doesn’t build fortitude. Grainger was not a man of many words, but was known to always give his full time and attention to whomever he was with, no matter how busy his schedule was. He was known to stand up for women when male students did not fully respect them, and believed strongly in their abilities. He often trained women to be ready for work in the conference, even though employment opportunities for women at that time were rare. Finally, though he constantly used his Bible, he never made a mark in it because he worked hard to memorize Scripture. “W.C. is as true a Christian as Christian gets,” some old guy likely said. So, what did I find out? Grainger Hall’s namesake always gave his time to others, deeply respected women, and was passionate about the Bible. That’s a Man of Grainger, and it makes me even more proud to be a part of MOG. I’m writing this from a plane flying me home from Phoenix where I served in my friend’s wedding. The two of us met seven years ago as neighbors on Grainger’s third floor. I’ve got four more weddings in the next six months, all for guys I lived with at PUC. I’ll say again, one of the best parts of the PUC experience is the residence life. Keep in mind, all of our dorms are great., each with their own story. I hear Jim Newton invented the spork. Following my PUC graduation, I moved down to San Diego to work at a church with an ocean view and perfect weather—and yet, I miss having 160 roommates. It helped shape who I am, created lasting memories, and gave me life-long friends. I may not be quite the man William C. Grainger was, but I think I’ve got one thing figured out: If you’re going to PUC, don’t be afraid to pass on the apartment.